Psycho Clown was bloodied and handcuffed to the cage as Pagano escaped. Pagano earned the chance to choose the referee for their match at Triplemania, and of course picked Tirantes. Air Date: 08/27 & 09/03. Of note, this show was in the 6 sided ring, which hasn’t been seen a lot this year. Not sure what happened to Fenix. AAA’s recap avoids mentioning anything. Fenix did a Facebook Live while promoting a show in Dallas today and, after about 15:39 of Fenix promoting upcoming shows and kindly saying hi to various people, he acknowledges he missed both Veracruz and a previous show in Aguascalientes due to for majerue, apologizes, and moves right onto saying hi to Brian (Cage?). AAA knew enough in advance to have Garza Jr. in Veracruz. I presume Fenix is still working TripleMania, because it’s TripleMania, but I’d also assume we’d never be told about a change until someone else walks out in Fenix’s place. That was the case last night. Carta Brava Jr. is one of the names who left earlier in the year and appears to be back. About a month after Carta Brava Jr. left, Goya Kong did an interview insisting she and her partner had actually not left AAA. Carta Brava Jr. didn’t get booked a lot on the indies and hasn’t been seen since June, so it’s possible they could’ve both made a quick u-turn and Carta’s been back training with AAA in hopes of getting another chance. He’s been very good in the openers in the past (and that match is much better for him being involved), but has been stuck in that position for years. Fantasma actually defends his title? 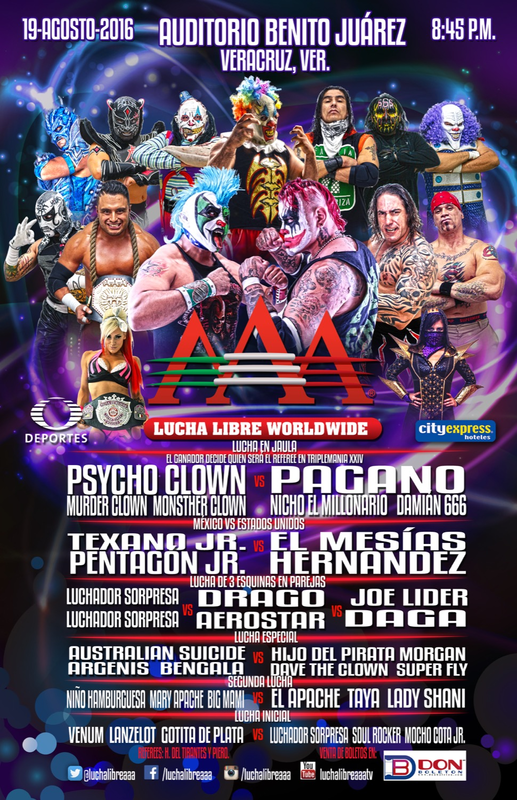 This gets AAA around the short time to build, since it’s a lot of matches they’ve already teased (and matches I thought might be on TripleMania.) I mostly want Daga/Suicide to happen already. Next taping is TripleMania next Sunday. 12:41. Bucanero’s team took 1/3, reversing a cradle on Super Crazy. They both said they’d win their hair match afterwards. 8:51. Rudos took 1/2, the last when La Mascara pulled Dragon Lee’s mask and rolled him up. CMLL’s on cruise control to the 09/02 show, doing the start of build up finishes you’d expect. It’s more notable what they didn’t try to do; there’s no sign of a significant 09/16 match on the horizon. They might not want to distract from the first show, but it’s looking more like the second show will have a tournament or other trophy competition than a second apuesta match of note. The rest of this weekend is full of shows of note. I feel like I may have written too much about shows of which we may never see, but I might as well do it one more time. CaraLucha returns tonight to Arena San Juan, with a main event of Flamita vs Xtreme Tiger. Centvrion & Fly Warrior face Dragon Lee & el Bandido in the semimain, and usual partners Rayo Star & Sky Man have a match for the Mucha Luchas Suprem championship. CMLL’s weekly Saturday show has Mistico, Blue Panther and Stuka Jr. against Mr. Niebla, Ephesto and Rey Bucanero in the main event. NJPW’s Super J show takes place late tonight/early tomorrow morning Central Time, with a Caristico, Volador and Titan versus Gran Guerrero, Euforia and Ultimo Guerrero main event. ChilangaMask has an odd collection of matches, including Terrible versus Juventud Guerrera, Xtreme Tiger vs Laredo Kid vs Jason Kincaid, and Ares (Aken) & Impulso vs Dave Crist & Jason Gory. MDA in Monterrey holds their second of two anniversary shows with oddly designed main events: Atlantis, Dos Caras and LA Park take on Ciafan, Canek & Rush, as well as father son team Mistico & Pierroth versus La Mascara & Silver King. Argos, Dr. Karonte Jr. and Caristico beat Euforia, Gran Guerrero and Ultimo Guerrero in Cuernavaca by DQ. Looks like a full house. The DQ set up Euforia/Gran Guerrero vs Argos/Karonte on the next show. RIOT announced a 09/10 show, Riotmon, in the usual location of Arena LLF in Monterrey. DTU has a 09/11 show in Poza Rica, Veracruz. Celebrity Apprentice premiers on NBC in January. That’s the other show Lucha Underground executive producer Eric Van Wagenen appears on, and Melissa Santos was said to have a role on the show. All the episodes (except the finale) were said to have been taped in between Lucha Underground seasons 2 and 3, so it wouldn’t seem to affect any Season 4 schedule. Cult Icon compares LA Park and La Parka. A dream team of tecnicos against strong rudos (should Casas be there) and La Mascara in the main event. Los Ingobernables team up for the second straight week in the fifth match. Maybe they can do a battle to decide who owns the name on 09/16. The Elite guys make a return in the third match, and Soberano versus Hechicero is a good lightning match for both guys. Second match is the 10th Panthers/NJPW match already. 1) Príncipe Pantera Jr. vs Duck Black Jr.
3) Alas de Acero & Iron Kid vs Boomerang & Fuego Jr.
5) Hijo De Octagon, Hurcan Ramírez Jr., Máscara Sagrada Jr. vs Histeria, Monsther, Scorpió Jr.
Not on IWRG’s site, but is on the promotion’s website and makes a little sense – IWRG’s probably thrilled to rent out the arena rather than put on a show against TripleMania. This is a Toluca promotion and a government sponsored free show. What was good: The first three matches were good. I think the opener might have been the best match on the show, a rarity in CMLL. The two matches building up the Anniversary matches were the weakest on the show, but they were also clearly intended more to position people for that match than to be good matches tonight. Where can I watch it: It should be on CMLL’s YouTube channel, though they were having some technical issues.